We recently moved some rooms around in our house. Calvin is now down with his brothers, so we're turning one room in our home to a designated office for Russ and me. We both have our side gigs, and we've both been operating in difficult spaces since we moved into our home almost three years ago. I am so excited to put together a little pretty corner for myself with a big desk and some beautiful wall space! 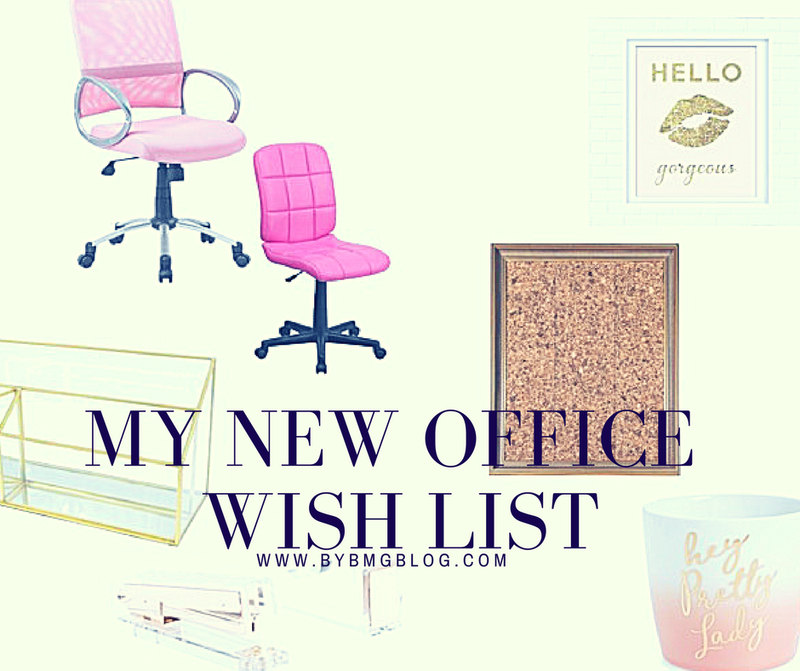 I'm gathering a wish list of things I want to decorate the space with. 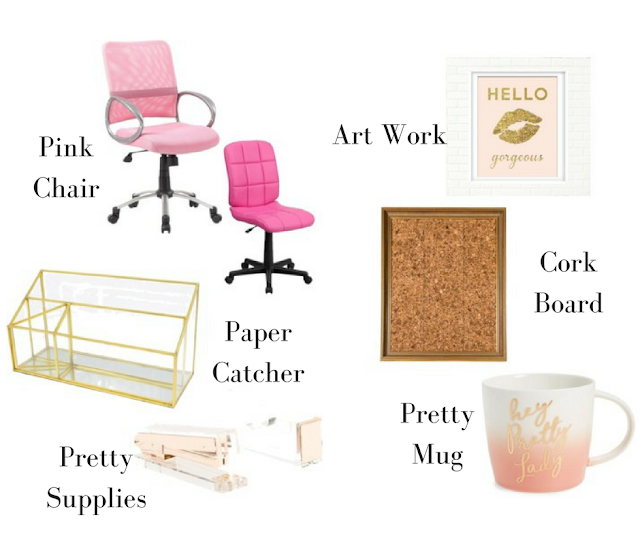 Blush pink, gold, and cork, so I've rounded up some ideas! This is the desk I have coming, and I wanted a fun chair to go with it. I found this chair on Amazon and it's kind of a mix between the two pictured. It is blush-ish pink and has no arms to it. I want to pretty up the wall space with things that match the color scheme, too. I know I can find some great printable that incorporate these colors because they're totally trendy right now. I also want a pretty cork board to pin reminders to and I love this one with the beautiful frame around it. I don't have a real tape dispenser or stapler at home and I find myself wanting both, especially tape, a lot. I think getting a fun pretty dispenser would make the space feel real official! I always have papers floating around - receipts, notes, and I use a notebook to record ideas in, so having a tray to keep that all in will be very helpful. 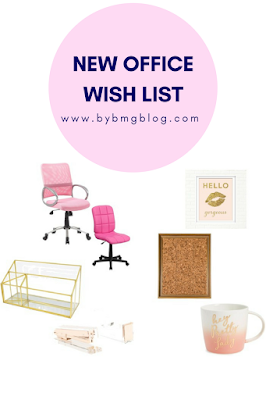 Last, what's a cute office without a fun mug?! I will have to see what I have around the house, but I love this blush and gold one! I am so excited for this new space. I will make sure to share pictures when I get it all finished! 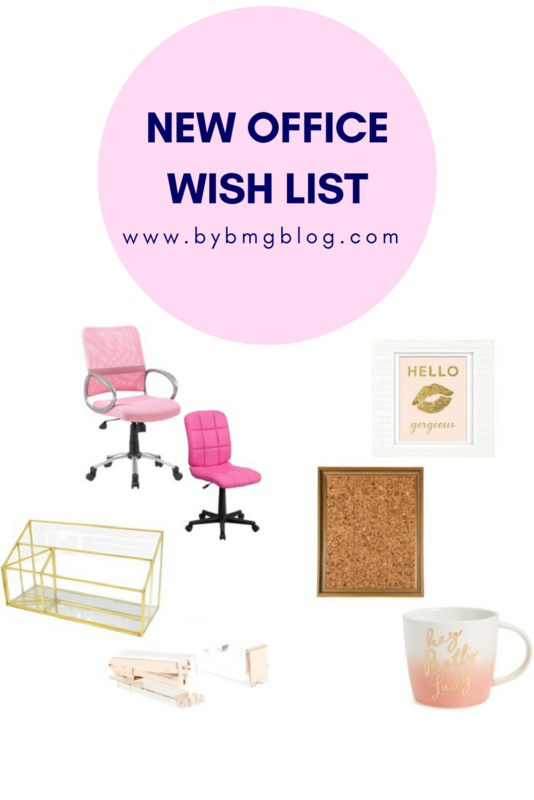 Do you have an office space? What are your must haves?